So public money is tight (but doesn’t have to be if you are a believer in Modern Monetary Theory) and in an ever-changing world funding bodies and individuals are looking for new ways to get the cash to the right people. Recently JISC piloted the JISC Elevator which is a platform for people to pitch their ideas to the community which are then voted on, the best being selected by JISC for funding of up to £10k. The combination of crowd sourcing and small agile projects enables experimentation with new ideas and technology that appeal to a large group of people while keeping costs and risks low. In total 26 ideas were submitted to the Elevator, 20 getting enough votes for funding consideration (the Elevator team already recognise the vote target was too low. It was a pilot). Personally I think the Elevator model is a great idea and with some tweaking is potentially a great way for the community to not only help project proposers refine their ideas but also provide a filter to help the best ideas surface to the top. The model is however does have some potential weaknesses. The main one for me is the ‘investment’ from project supporters is very low. It’s like playing poker for matches, you end up with a lot of bluffing because at the end of the day you’re not going to lose any money. That’s not to say Elevator project backers are making no investment. I’m sure factors like personal reputation form part of a psychological investment in an idea. As I also mention in the comments of Joss Winn’s The cost of developing a good idea post I think the Elevator model would be great for funding students to investigate and develop ideas that will use technology to improve education and research (funding students was one of the original Elevator use cases, so it’s not like it hasn’t been considered. I would however like to see a dedicated ‘JISC Student Elevator’). Kickstarter is a new way to fund creative projects. A good idea, communicated well, can spread fast and wide. A large group of people can be a tremendous source of money and encouragement. Kickstarter is powered by a unique all-or-nothing funding method where projects must be fully-funded or no money changes hands. 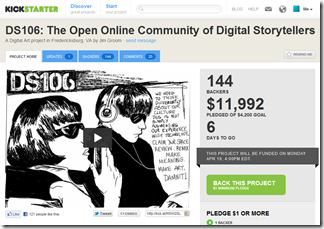 The idea is people create project proposals on the Kickstarter site with similar JISC Elevator type video pitches. Projects create a funding target and deadline. People can then financially contribute amounts based on a project defined payment spine. For example $25 might get you a copy of the final product where as $500 might get you a copy plus a credit or backlink. If you read the post linked to in the tweet you’ll see that Jim and his UMW colleague Tim Owens have created a kickstarter project to support the infrastructure behind the MAOC* DS106 Digital Storytelling. Here’s also a follow-up where Jim continues the engagement with the community to see how they should spend the money. Currently #ds106 has raised almost $12k from 144 backers and it still has 6 days left for more funding to come in. Note: Before rushing off to kickstart your own project it’s worth noting that you need to “Be a permanent US resident and at least 18 years of age with a Social Security Number (or EIN), a US bank account, US address, US state-issued ID (driver’s license), and major US credit or debit card.” – so if I was going down this route I’d be looking for an American project sponsor/partner. It’s worth checking the Kickstarter.com Starting a Project FAQs. SmartHistory: Raised $11,513 for a Web site created by two art historians. Punk Mathematics: Raised 28,701 for a book of mathematical stories. Open Educational Resources for Typography: Raised $13,088 to develop teaching materials for courses on typography. Trade School: Raised $9,133 to run a program that turns storefronts into temporary trade schools. Brooklyn Brainery: Raised $9,629 to set up a collaborative school whose courses would cost $25 for four weeks. Given my current role the OER for Typography project is particularly interesting especially as the question of open education sustainability gets louder and funding for even the headliners like MIT’s OpenCourseWare apparently gets tight. The comments in the Chronicle article also highlight the unease within the sector around funding sources and the general cost of education. My opinion is given the nature of projects like DS106 it’s entirely fitting that not only is the community contributing to rich environment of learning, but those who can are also supporting the infrastructure it’s based on. I think it might also be an interesting way for students to directly fund an idea they have or do something with the institution as a recognised mentor. So in the right instances open education funding by the people for the people has to be a good thing, right?